by Martin Malden on 5 August, 2010. Last updated on 5 August, 2010. Very simply, I set up a TwitterFeed account a while ago. This takes the RSS feed from my site. Within my TwitterFeed account I set up services to Facebook and Twitter (both require verification). TwitterFeed takes the first 140 characters of each post from my RSS feed, including the link (which it shortens), and posts my articles to both Facebook and Twitter. I then added my Twitter account to all of my other social sites, so they now automatically publish my tweeted articles (including the link) as status updates. Hey presto, my articles are syndicated far and wide, and all without using a plugin. When setting up TwitterFeed do you use your ‘feedburner’ feed or the original feed coming through your site? I use my Feedburner feed. I use the Feedburner feed wherever I plant my RSS link. Very useful. I implemented it immediately. Thanks. You’re very welcome – and I like that adaptation of Thesis that you’re using! I really enjoyed reading this article, I find that content syndication is extremely vital in todays online market. 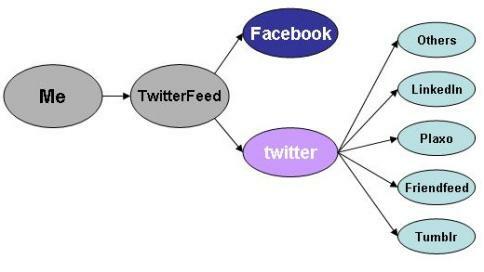 Building backlinks through websites like Twitter, Friend Feed, Identi.ca, Amplify, Multiply, Delicious, etc. is so easy that it’s dumb not to be doing it, because you can setup all of this to go on automatically. Awesome tool. I have used Su.pr in the past, but this looks even simpler – and less time consuming. I’ll definitely be trying this. Thanks for that article Martin, it help me make a decision! I have been on the fence about getting a business page and I have all the information and details about how to do it but just couldn’t commit … I had a page set up a long time ago when I thought that it would be a good way to keep in touch with family members that I only see about once a year, keeping up with photos etc. but I eventually couldn’t stand all the additional friends of friends to the nth degree! You’re very welcome, Fran, glad it was useful! I started writing my blog a few months back and trust me I was looking for something like that. Thank you for providing us with some useful tips. Hope it spreads the word for my site.